...I rarely have fresh insights about Jesus (those are best left to theologians and heretics) but I had six thoughts that, however banal or obvious, might be worth sharing. “Jesus is not a Republican or a Democrat,” said my friend John Mark Reynolds, “He’s probably a monarchist.” When I first heard that claim I thought it was clever; now I find it to be a profound insight. Jesus constantly talked about the Kingdom of Heaven. So why do so few Christians talk about it? One reason, I believe, is that we are now all republicans and democrats (small-R, small-D) and simply don’t understand what Jesus is talking about. We may use the term “Lord” and “King of Kings” but—unlike the vast majority of people throughout history—we do not comprehend what it means to live under the reign of a king. We need some remedial training on how to live as subjects in a kingdom. We may be justified in rejecting the divine right of kings to rule but we cannot justify rejecting the rule of our divine king. 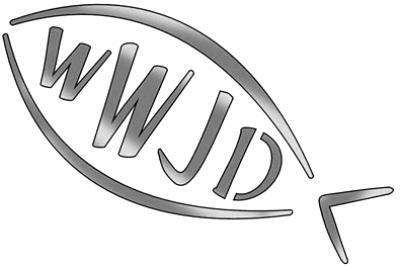 In 1896 a Christian socialist named Charles Sheldon wrote a book called In His Steps which popularized the slogan “What Would Jesus Do” and inspired two of the most well-intentioned but misguided fads of the twentieth century: the Social Gospel movement and the marketing of WWJD paraphernalia. The problem with both is that they are based on WWJD and that is the wrong question.